20 cad plated bolts for bolting up the sump on the Model A Ford engine. Made in USA. Engine Pan set for the 1928-31 Model A Ford. They fit between the engine and the chassis. Most model A's are missing these, but they help air flow through the engine compartment, which is important for radiator cooling. Set of 2. Made in USA. Don't forget the A-6775-MB mounting kit, if you dont have pans currently fitted to your Model A. An 18 piece set to mount the engine splash pans to the frame. Made in USA. If you have an early 1928 oil sump, these are the bolts & washers needed to mount the clean out cover to the sump. Made in USA. 1928 Sump plug which was only used on the early sump that had the clean-out plate on the bottom that allowed you to drop the pump without removing the oil pan. Thread size 7/8" x 16, Gasket included. Made in USA. These are the large shape authentic copper sump plug gaskets for the early 1928 sump plug. Usually fitted to the sump that has a removable clean out plate for the oil pump. Sump plug thread repair kit for the 1909-31 Ford. This kit allows you to repair a stripped oil drain plug hole without removing the motor from the car. A special adapter threads into what is left of your old hole cutting new threads as it goes in. The adapter accepts a new style smaller drain plug that is included. If your threads are stripped in your oil sump, this insert can be welded into the sump giving you new threads, so that you can use a new A-6730 sump plug. Note: Sump must be off of the car for installing. 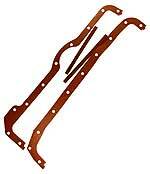 A complete set of all the modern style gaskets needed when removing the oil sump.